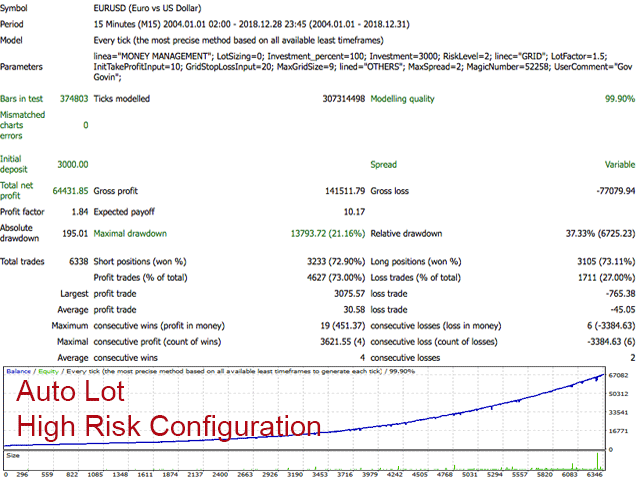 Tiger Grid EA is an expert advisor using trading strategy which has been developed by using machine learning concepts. It has passed 14 years of backtest of real tick data and real variable spread (with commission) from 2004 to 2018. The entries are usually accurate and in case if the trend signal has a delay the positions will be managed by a smart grid system. This system uses a grid of orders which increases lot size. A new order is added into the grid only if the EA notice a potential reversal trend. The grid size is limited for more safety. Optimized to work with EURUSD for timeframe M15. Minimum recommended deposit is $3000 for initial lot set to 0.01. Help with the installation and configuration of Expert Advisors. Feel free to send me a message. Lot Sizing Type - method to calculate lot sizing and stop loss. 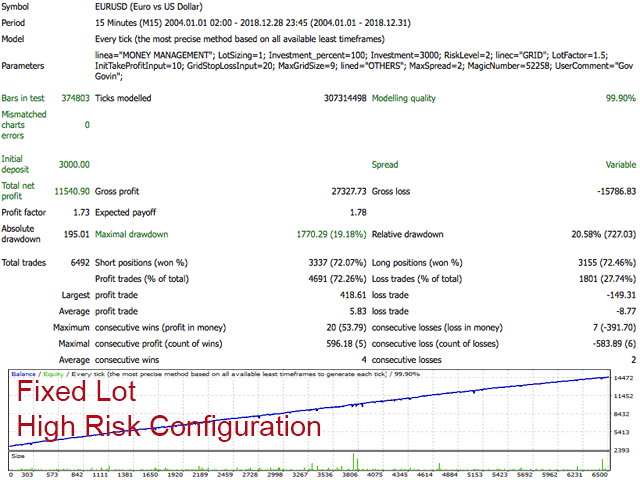 Investment for auto lot (unit in % of balance) - Amount to invest in account currency. Use this parameter only if lot sizing is "Auto Lot"
Investment for fixed lot (unit in currency of account) - Amount to invest in account currency. 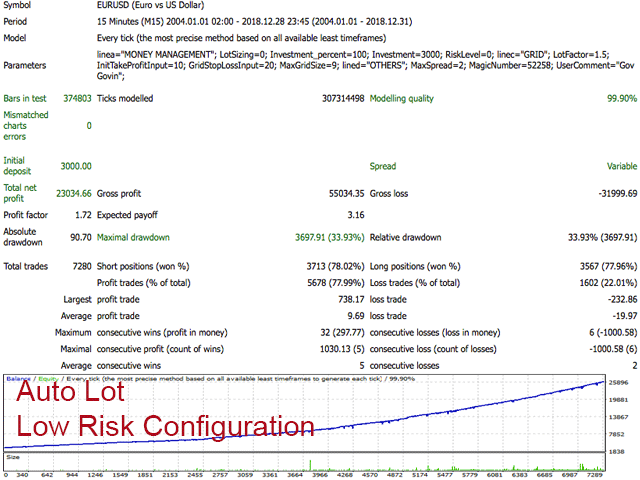 Use this parameter only if lot sizing is "Fixed Lot"
Risk Level - Risk level of your investment. It will take profit. Magic Number other EA - magic number from another EA. It opens a grid if there is no opened orders from another EA with this magic number. 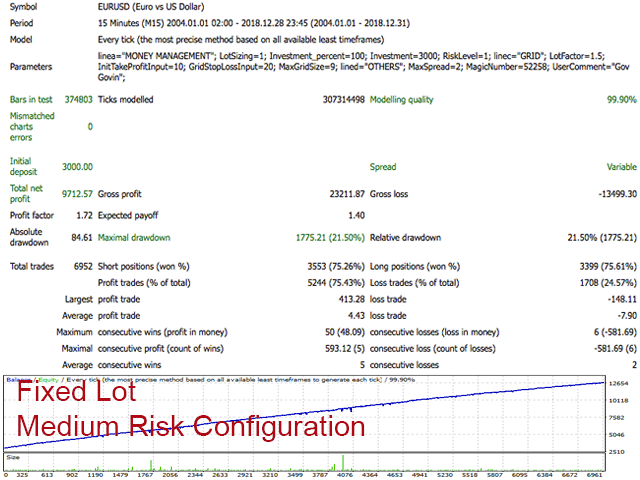 With this parameter you can use another grid system on the same trading account without having two opened grids in parallel.